Section 179 is a government incentive to encourage businesses like yours to purchase equipment. This is a “win-win” for all businesses, because you can purchase the equipment you need, invest in growing your business, and contribute to the economy. The best part is – at the end of the year, the total amount of the equipment purchase can be deducted from your taxes, as opposed to only the depreciated amount. Whether you spend $5,000 on a couple of new computers and printers or $1,000,000 for a few large pieces of construction equipment, Section 179 can help you! In the past, business owners were only able to deduct small amounts of their equipment purchases over time, as the items depreciated year to year. With Section 179, you can deduct the full amount the first year the equipment is put into service. This means you can buy more equipment and deduct the purchase amount from your gross income every year. 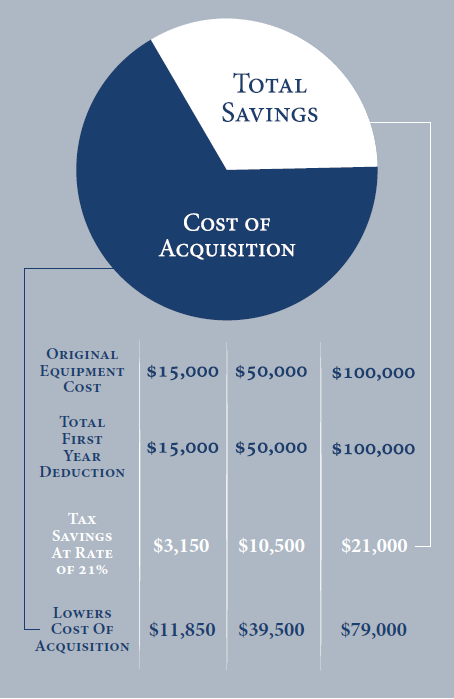 the tax deduction limit has increased from $500,000 to $1,000,000. Take advantage of this deduction today! What is Section 179 and Why is it Important to my Business? limit has increased from $500,000 to $1,000,000.